I would like to compare McConkie’s formula for receiving personal revelation to the one used by Joseph Smith in the translation of The Book of Mormon to see if Joseph Smith was really in a position to receive revelation from God. The internet is a helpful resource for documentation of Joseph Smith’s occult activities as well as his conviction in Bainbridge, New York, on March 20, 1826, for swindling an employer by claiming he could find buried treasure with his seer stone. What is significant about this court record is the timing of the conviction. 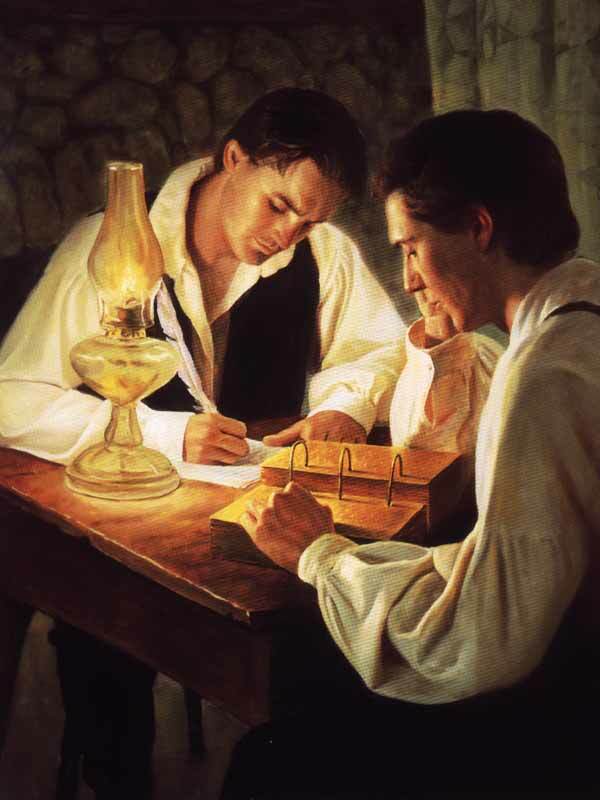 Joseph Smith was convicted after he supposedly had a vision of Heavenly Father, Jesus Christ, and the angel Moroni, but before the translation of The Book of Mormon. The translation process for The Book of Mormon is also well-documented on the internet. In contrast with the limited information provided to members or investigators of the LDS church, the details of the translation process can now be found with a couple clicks of the mouse so that the method of translation is no longer a disputed fact between the LDS and non-LDS (although the responses to this information still vary considerably). Isaac Hale, the father of Emma Hale Smith, stated in an 1834 affidavit: “The manner in which he pretended to read and interpret, was the same as when he looked for the money-diggers, with a stone in his hat, and his hat over his face, while the Book of Plates were at the same time hid in the woods” ( Affidavit of Isaac Hale dated March 20, 1834, cited in Rodger I. Anderson, Joseph Smith’s New York Reputation Reexamined, Salt Lake City: Signature Books, 1990, pp. 126-128 as cited on irr.org). There shall not be found among you any one that…useth divination, or an observer of times, or an enchanter, or a witch… (Deuteronomy 18:10). Then the LORD said unto me, The prophets prophesy lies in my name: I sent them not, neither have I commanded them, neither spake unto them: they prophesy unto you a false vision and divination, and a thing of nought, and the deceit of their heart (Jeremiah 14:14). Even The Book of Mormon identifies magic and sorceries with the work of the evil one (Mormon 1:19, Mormon 2:18). How am I to understand that Joseph Smith was a true prophet of God and not one of the false prophets Jesus warned us would come (Matthew 24:11, 24-26)? I remember being told by kids in my school that Joseph translated the BoM by putting his head in a hat and I thought they were crazy for suggesting such a thing. When I read the personal accounts (some of which you have used) for myself, I could not believe they were right. How could these Baptists know more than me about my own religion? Why was I not taught this and why did I teach something so different to people while on my mission? I have come to the conclusion that it is because no one would take it seriously if they knew the truth upfront. First a note about the internet. You say it is a great place to learn the “facts” about things like Joseph Smith’s translation process. It is also a great place to learn about all the aliens landing on earth to exterminate our planet. Point- not everything you read on the internet is reality. Everybody has bias, but few acknowledge it. Now- about the translation of the Book of Mormon- we do not know for sure all the details. You don’t quote Oliver Cowdery the primary scribe who penned the majority of Joseph’s words. It is important to note that none of the witnesses of the Gold Plates or scribes ever denied their testimonies of that experience. While we do not know for sure the details of translation, we do know the Urim and Thummim and seerstone were inolved- we don’t know how much either of them, or both of them were used through the whole process. My opinion, based on everything I read, is that initially, Joseph was totally unfamiliar with Reformed Egyptian and relied heavily if not totally on these tools. As time went on and he learned the language, he was able to translate without the seerstone or U&T. It is interesing that critics make a big deal of his using a hat. In reality, these descriptions of Joseph needing a dark room or under cover of hat/blanket are consistent with ancient descriptions of the Urim and Thummim. Ancient legends and texts describe such stones as radiating messages and words from God. I find no problem with Joseph using a hat to read words on a seerstone. There is actually ancient precedent for such a thing! As soon as an Evangelical is willing to make fun of Jesus for spitting in the mud and putting it on someone’s eyes, I will be willing to make fun of Joseph for sticking his head in a hat. Okay, so if it’s truly no big deal to Mormons why don’t they use the picture of Joseph with his head in his hat rather than this one on lds.org? It appears just plain deceptive to me. Do you know of any eyewitness accounts that describe that Joseph used the plates this way? As far as I know there are none. The eyewitnesses all described the plates as being hidden during the translation process. David Whitmer claims he saw the plates once “through the eyes of faith.” Royalton mentioned that there is a quote from Cowdery. I would be interested in seeing that. I am not aware that Cowdery saw Joseph translating with the plates. You seem to place the most weight on the selected statements from Emma, Martin Harris, or Whitmer. What about Oliver Cowdery, the primary scribe? Given that Oliver was the primary scribe for the bulk of the Book of Mormon, I would place the most weight upon these statements. The church’s representations are perfectly warranted.